The Secret Language of Spirit: Understanding Spirit Communication in Our Everyday Lives. 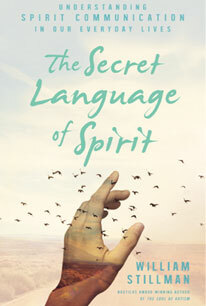 The Secret Language of Spirit is the culmination of award-winning author and psychic medium William Stillman’s wisdom and insights in a fascinating exploration of the sometimes blatant, sometimes hidden, spiritual symbolism in our everyday lives. With accessible language, easy-to-understand explanations, and amazing anecdotes, Stillman introduces to the open-minded layperson an “alternate lens” through which to view daily interactions with Spirit. Perhaps Stillman’s most powerful observations may be found in the chapter that correlates spiritual sensitivity between persons with autism, mental illness and dementia—individuals whose “gibberish” is often dismissed as pathology but which may actually provide glimpses into another realm. The Secret Language of Spirit concludes with an empowering chapter that addresses the concepts of abundance and achieving authenticity beginning with Love’s Foot Rule, twelve fundamental tenets to embrace. Stillman also introduces the principles of passion, pursuit and prosperity, and how to manifest them in concert with Spirit. "It is now time to speak to and hear from Spirit. This wave of expanded consciousness is exactly what we need to break out of our enslavement to matter and create a truly peaceful, prosperous self and peaceful, prosperous world. With The Secret Language of Spirit, William Stillman is at the forefront of this wave giving us the very skills we have been missing. We can now make this happen. "